TemboSocial has a proven 99.9+ percent uptime record for over 14 years. To ensure maximum uptime and continuous availability, TemboSocial provides redundant data protection along with a complete data recovery plan and is hosted at the premier data center in Canada. TemboSocial runs on two geographically dispersed, mirrored data centers located in Canada with built-in replication, disaster recovery, and a redundant network backbone. If one of these facilities goes down—because of a natural disaster, for example— the applications will fail-over to the other site with minimal interruption. on-site diesel generators for backup power and backups for the cooling systems and water supplies—make interruptions related to facility issues statistically extremely unlikely. Our network is fully redundant and been designed to eliminate any single points of failure. Data backups are automated and scheduled twice daily. These backups are encrypted by GPG, an open source security package, using DSA/ELG with key length 1024/2048. They are stored in the secure managed production environment. Data is encrypted and backed up every day to tape what is stored within the secure hosting facility. Data is stored for a period of two weeks. After 14 days, the data is permanently deleted from the backup tape. No data is ever removed from the secure hosting facility. 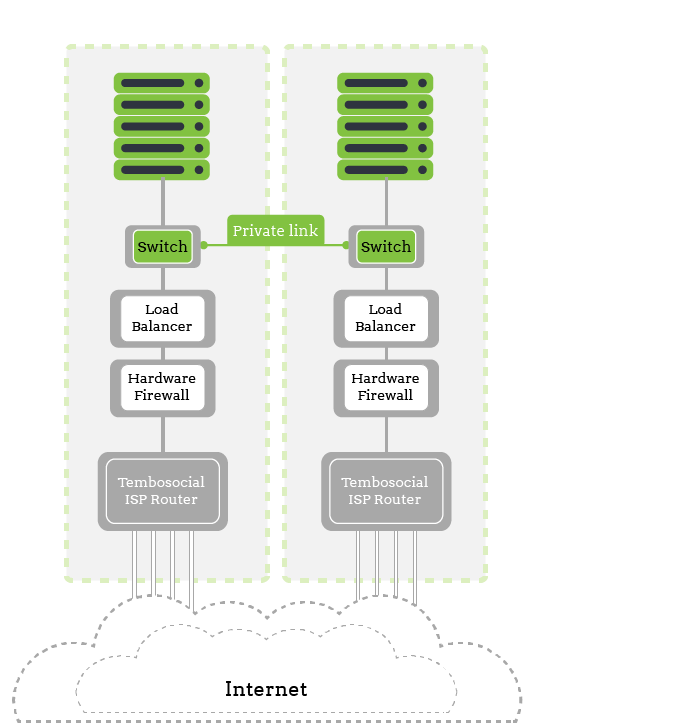 Customer data is stored in encrypted partitions on TemboSocial’s production servers. The encrypted partition is protected by the AES256 algorithm. Since partitions have to be manually mounted with a strong password after a system has rebooted, no data is intelligible even if the hard drive is physically removed from the server. AES ciphers have been analyzed extensively and are now the standard adopted by the U.S. government. Customers have their own separate logical database where their data does not reside in a shared table.